Extra Large 63 Ornate VICTORIAN Divided Wall Mirror Vanity Mantle HORCHOW. We are a family owned company that has been in the furniture and home decor business for over 15 years. These prices are limited to quantities on hand and are for a very limited period of time - they won't last long and you'll never see them again! Don't miss out on your chance to own a luxury item at a bargain price! Material: Premium Wood, Metal, Mirror Glass. Size: 41" x 63" x 2 deep. Central mirror glass is 24" x 36". Condition/ Quality: Brand New, First Quality. 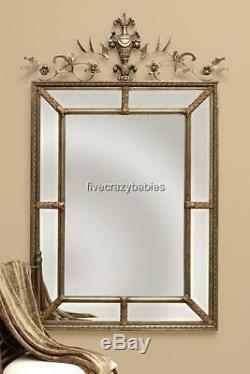 This stunning Victorian style mirror has an ornate period design. The central, deeply beveled mirror is surrounded by beveled mirror panels between the inner and outer frames. The thin frames are ornamented with scrolling acanthus leaves and braided metal rope. It is crowned with a gorgeous, intricate metal cartouche with an urn of three dimensional flowers. It has the exquisite glamour of a lavish Victorian antique. Use it in a bath or powder room, or in a hall or foyer to add a period elegance. It is an heirloom quality piece, as well made as the antiques which inspired it. It has a state of the art back coating to prevent oxidation and discoloration. Properly weighted hanging hardware is attached. We want you to shop with us again and again! Please read our store policies before purchasing! By purchasing this item, you are agreeing to the store policies as stated in the pages above. The item "Extra Large 63 Ornate VICTORIAN Divided Wall Mirror Vanity Mantle HORCHOW" is in sale since Thursday, November 23, 2017.